The Ogun State Governor, Senator Ibikunle Amosun has congratulated Comrade Adams Oshiomole for his outstanding performance in the last seven years of his administration as Governor of Edo State. Governor Amosun, represented by his Deputy, Chief (Mrs.) Yetunde Onanuga lauded the resilience spirit of integrity and hard work of Comrade Oshiomole at the town Hall meeting held at the Emagoro College multipurpose hall, Sapele Road, Benin City. Governor Amosun said Comrade Oshiomole had promoted the interest of democracy, peace and political stability of the Country which was in line with the vision and ideology of President Mohammadu Buhari’s administration in Nigeria. Amosun urged the Governor not to rest on his oars in breaking new grounds for the benefit of the teeming populace of his State in particular and Nigeria in general. 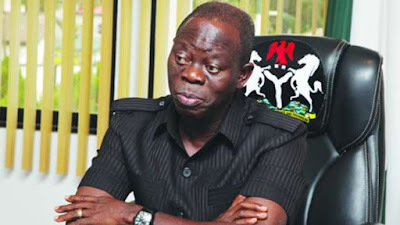 Earlier, Governor Oshiomole recounted his administration’s achievements in the past seven years, saying that “we are here to mark seven years of revolutionary changes in Edo State”. According to him, the State was on “cloud minus zero” when he became Governor but noted that his administration had brought tremendous changes to the State, stressing on his administration’s efforts on infrastructural development, water resources, provision of health care delivery among other life changing social amenities of note in the State.